Pet Ambulance Service - 24 Hours A Day, 7 Days A Week | P.E.T.S. Our professional and caring team will get your pet where it needs to go both safely and quickly. Helping get your pets where they need to be! P.E.T.S. specializes in transporting a pet in an emergency and non-emergency situation to a local veterinary hospital, specialty, or critical care facility of your choice. P.E.T.S. patients are transported in a fully-equipped pet ambulance with an experienced and caring professional staff 24 hours a day, 7 days a week. P.E.T.S. strives to streamline patient admittance by arranging pre approval and admission processes through our animal hospital partners. A payment will be taken as well as a deposit for the accepting hospital at the time of pickup. You can fill out admittance forms online before our transfer technician arrives. This makes things quick and easy for you so your pet can be efficiently transferred. 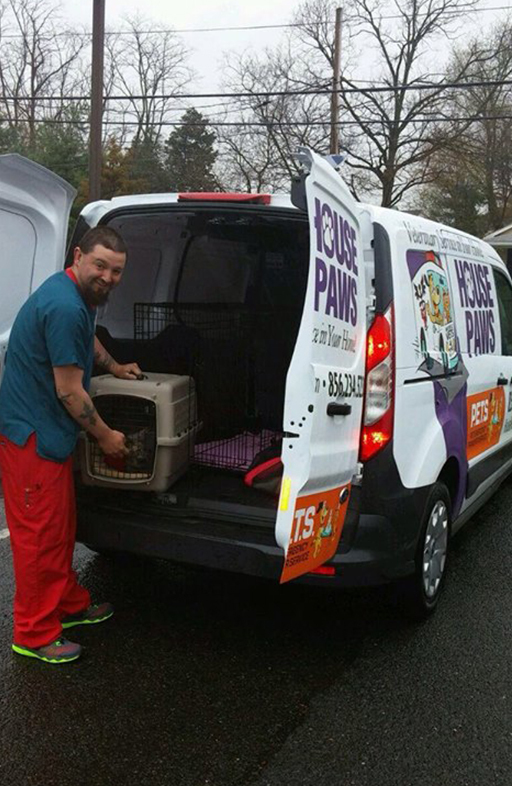 Dr. Lisa Aumiller, DVM who owns and operates the HousePaws Mobile Veterinary Service became aware of the need for an emergency transportation service. As a mobile vet, Dr. Lisa and her doctors were able to handle most calls for in home veterinary appointments. However, certain cases required immediate transfer to a hospital. Also some pet owners wanted to see their own vet or needed specialized care. The demand of daily life makes P.E.T.S. a great service for pet owners. A client and local business owner, Bob Bersin of In-Home Kitty Kare specifically brought the idea to Dr. Lisa for her mobile practice. Together they came up with the name of P.E.T.S. and launched the idea in the fall of 2014. Dr. Lisa decided to invest in P.E.T.S. and bring her expertise of being a mobile vet to a pet ambulance service. She has partnered with many local veterinarians and hospitals to give your pet the immediate care they need in an emergency situation. P.E.T.S. can help get your pets where they need to be! P.E.T.S. will pick up your pet at your home or veterinary hospital. Cats and other exotic animals are requested to be in carriers and dogs are requested to be on leashes. You can call us directly after you speak to your veterinarian and if your pet requires immediate veterinary care we will transport your pet directly to your veterinarian or an emergency hospital. We are located in Mt. Laurel, NJ which is 20 minutes from Philadelphia and centrally located in South Jersey. See our map for the coverage area. There are many excellent emergency and critical care veterinary hospitals in the area but there are few if any ambulances to transport your pet. Please consider P.E.T.S. for your pet transportation needs.